(1) I am obsessed with this gorgeous OUTFIT ; (2) The vanilla tone of this cotton drill sleeveless dress by STELLA MCCARTNEY is perfection; (3) A throwback to September 2014, when ZsaZsa Bellagio made white out fun and relevant; (4) You can't go wrong with this Étoile Isabel Marant white cotton top embellished with ruffled sleeves and eyelet embroidery; (5) This is the spring coat we all should own and maximize, dressed up or down; (6) Because lace is in, this is dress is comfy and classy, and ZARA just really knows how to do fashion and style right - still my favorite clothing brand to shop at. Back in yesteryears, candles were confined to church, birthdays, a few posh bistros and power cuts. These days, though, we live in a candle culture. If they're not adorning our dining tables, they're creating ambiance and atmosphere in the living room or transforming suburban bathrooms into chic havens of tranquility. Whether you buy in bulk at Yankee Candle or indulge yourself with bougie Dyptique candles, it's likely that candles will be a star feature in your interior decor. For me, aside from satisfying my sense of smell, they satiate my desire for aesthetic inspiration in my home. Three tasteful ivory church candles in a gilded candelabra on the console table and boom, you've increased the value of your home. A hard day at work? Light up that Jo Malone almond macaron scented candle while taking a bubble bath, and feel those cares ebb away. For me at least, candles are perhaps the easiest and most attractive way of buying into a designer lifestyle in the same way that we accessorize with designer goods and parfums. There's a magical quality to candlelight. There is something both comforting and empowering with a candle’s flame, a fiery softness, a warm glow, a graceful movement. The atavistic attraction of fire is impossible to attain with anything other than real flame, and I suppose this is why they fascinate me so much. Here are some of favorite candles. I saw sparks. Burn, baby, burn. Diptyque is unequivocally the leader in the world of fragrance with all-natural scents, both complex and intriguing. From the streets of Paris straight to your home. Cire Trudon Candles have been referred to as the "Rolls Royce" of candles. The oldest French manufacturer produces the world's most prestigious candles of the highest quality with hand blown glass and pure vegetable wax. Each Cire Trudon Mini Candle is poured into a mini hand-blown gold crested green signature glass and housed individually in Cire Trudon's signature blue-green box. $55 USD for 30 hour burn time. My favorite is ERNESTO because it is named after my dad, but also because the this is a strong masculine scent. Inspired by sizzling under the stubborn sun of the Revolution, fierce overtones of leather and tobacco meddled with the waxy silence of wood. Head fragrance notes include rum, grapefruit, bergamot; Heart fragrance notes: clove, oakwood, patchouli; Bottom fragrance notes: moss,leather, amber. The freshest and cleanest smelling candle I have ever burned based on the popular au The Blanc perfume. $70 for 220g. Head fragrance note: Artemisia; Heart fragrance note: White Tea; Bottom fragrance note: Musk. My mom, sister JL, and I all wear this perfume scent. I felt compelled to purchase this last holiday season because I was mostly excited that they turned this scent into a candle. It is currently on my bedroom nightstand and I feel closer to them when I light it up. Because the inner bibliophile in me clamors for this scent. Aside from its witty and sophisticated name, this candle burns in my home office and library because of the inspiration it provides. It transports you to the world of old books and comfy leather couches and evokes the scent of an old manuscript. Henry Ward Beecher once said, "A library is not a luxury but one of the necessities of life." Cheers to books and candles! 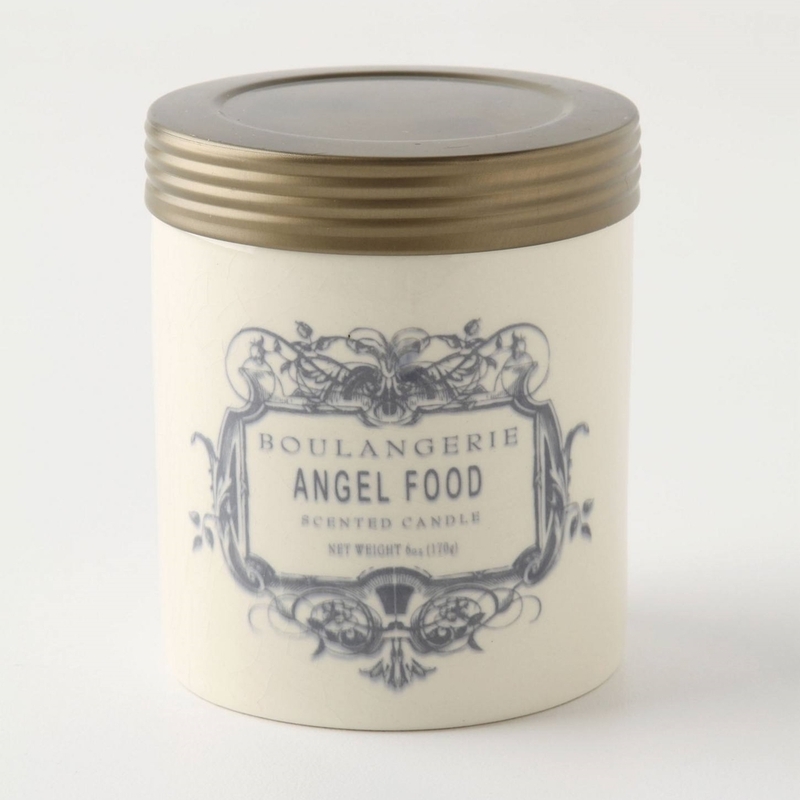 My staple candle that can be found in almost every corner of my home which drives guests to always say that my house smells like a bakery, this scent lights up my face like it lights up my tiffany blue walls. With a 20-year legacy, Minnesota-based fragrance label Illume is best known for its luxuriously-scented, clean-burning candles. Each signature scent is crafted by hand from all-natural, food-grade ingredients like coconut wax and essential oils, creating an inviting atmosphere wherever one is lit. The mouthwatering aromas of French desserts arise from vintage Parisian pottery replicas. Fragrance notes sweet vanilla, butter and caramel combine to create this decadent mixture. $16 for 35 hour burn time; $26 for 80 hour burn time. Store scented candles in the fridge to keep them fresh. Always trim the wick to ¼ inches to avoid fast burning and excess smoke. Use a toenail clipper to trim wicks where scissors won't fit. Burning a candle next to your chopping board will prevent you from crying when chopping onions. Colored candles will fade in sunlight, so keep them away from windows. Your sense of smell changes frequently, experiment and invest on different scents for different spaces. Most of the people I know accept and celebrate my affinity for bright colors. In my gym for example, one of the other members said that he and his wife call me "the girl with the neon Nikes." Though I have this deep devotion to color, lately, I find myself drawn to neutrals, shades of gray, white on white, and of course, all black everything, like JayZ sings in "Run This Town." And when monochrome is combined with leather, I am beguiled by the powerful duo of hue and texture.